Keywords: Intelligent robot, aging-in-place, activities of daily living (ADL), enabling occupations, assistive technology. Intelligent mobile robots have the potential to play a vital role in the next stage of smart home technologies. This pilot project aims to design a personal assistive robot that can socially interact with older adults with Alzheimer’s disease and other dementias in their daily lives and offer assistance (e.g. step by step prompting for daily activities as with COACH) whenever required. The research will include building working prototypes (hardware and software) and evaluating them with older adults with Alzheimer’s disease and their caregivers. 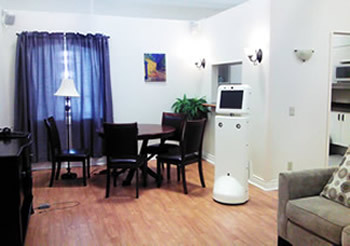 It is hoped that a socially interactive mobile robot can encourage independent completion of activities by older adults with Alzheimer’s disease, thereby supporting their ability to age-in-place and reducing the dependence on caregivers. Video of tea making with the personal robot. Begum, M., Wang, R.H., Huq, R. and Mihailidis, A. (2013, submitted). Performance of daily activities by older adults with dementia: The role of an assistive robot. 13th International Conference on Rehabilitation Robotics, June 24-26, Seattle, USA. Wang, R.H., Viswanathan, P., Czarnuch, S., Boger, J., Nejat, G., and Mihailidis, A. (2013). Developing advanced assistive technologies for older adults with dementia: Lessons learned. RESNA 2013, June 22-24, Bellevue, USA. Wang, R.H. and Mihailidis, A. (2012, Abstract). Robotics for older adults: Rehabilitation applications for body functions and structures, and activities and participation. Canadian Association on Gerontology (CAG) 41st Annual Scientific and Educational Meeting, October 18-20, Vancouver, Canada.